See cap without eyes at bottom of pattern. Pattern has now been tested by Virginia in WA, thanks Virginia. Caps in photo were knit with Red Heart Super Saver (4) Warm Brown. C4F: Slip next 2 sts purl wise to cable needle (or double point needle) and hold to front of work, K2, K2 from cable needle. C2B: Slip next st purl wise to cable needle (or double point needle) and hold to back of work, K1, K1 from cable needle. C2F: Slip next st purl wise to cable needle (or double point needle) and hold to front of work, K1, K1 from cable needle. With 16 inch needle, cast on 54 (62, 72) sts. Join and work in the round. 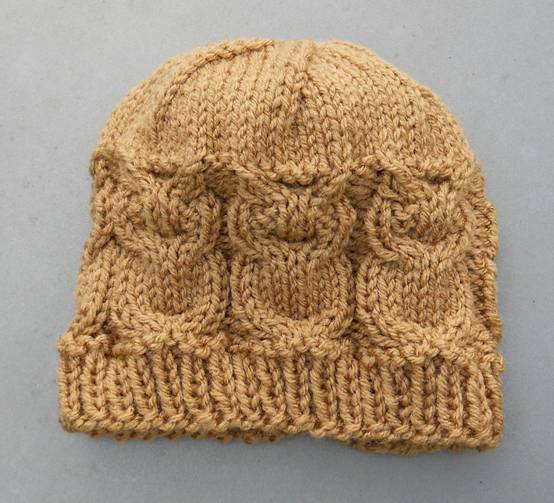 Knit until cap is approximately 4.75 (5.5, 6.0) inches from cast on edge. Cut yarn, weave end through remaining 6 (7, 8) sts. Draw tight and weave in end. Fasten off leaving about a 6 inch tail for sewing eye to cap. The cap in photo was knit with Red Heart Super Saver in Heartfelt. With 16 inch needle, cast on 48, (52, 60, 64) sts. Join and work in the round. Repeat round 1 until cap measures 3, (3.5, 4, 4.5) inches from cast on edge. 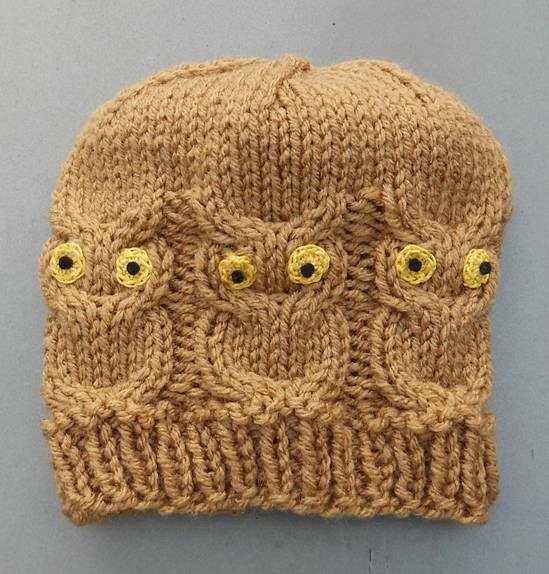 Knit every round until cap measures 7 (7.5, 8, 8.5) inches from cast on edge. Weave in beginning end on the right side, so that when the cuff is turned up it doesn’t show.